The sound of Rock Around the Clock reverberated around the new school dining space as the teachers and pupils danced to Bill Haley’s famous rock ‘n’ roll hit. 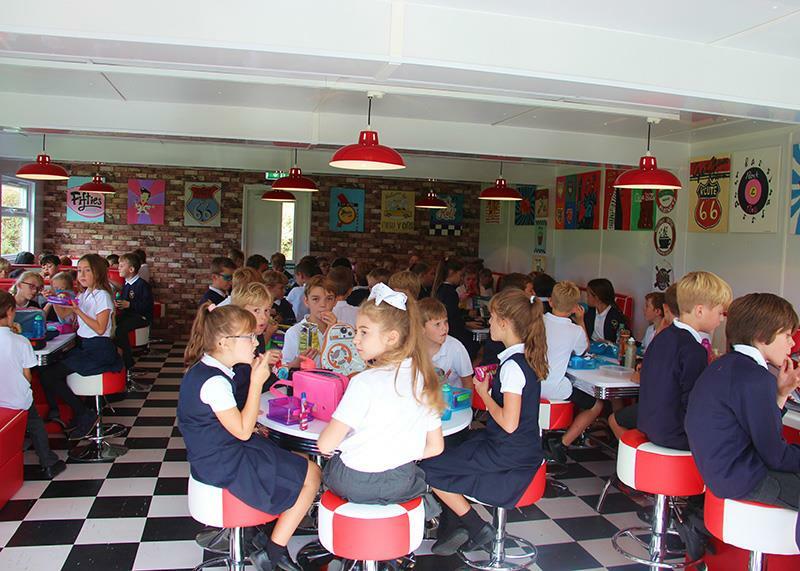 It was back in September and everyone at Aldingbourne Primary School had gathered to celebrate the opening of the school’s stunning 1950s-style American diner. Aldingbourne, an oversubscribed one-form entry school just outside Chichester in West Sussex, doesn’t do things by halves. Instead of choosing to build a costly extension to house its new eating area the school bought four shipping containers, welded them together and created the Busy Bee Diner. Headteacher Liz Webster decided to hold a 1950s day to mark the grand opening of the diner, which boasts red and white booths, tables and stools and a smart black and white chequerboard floor. A year 6 boy, Alfie Drake, cut the ribbon and the 210 pupils and staff, all dressed up to the nines in 1950s outfits, sipped celebratory milkshakes. Hits by Jerry Lee Lewis, Elvis Presley and Bill Haley and His Comets blared out of the jukebox and the school took to the dance floor. The project is just one of the ways in which Ms Webster and her staff and governors have devised exciting, creative and cost-effective ways to make the most of the school site. Aldingbourne’s innovative approach to facilities began in 2014 when Ms Webster realised she needed to create a separate space for quiet time and support work. The school was built in 1975 and its semi-open-plan design mean that the six classrooms have no doors or dividing walls. “We looked at having an extension built but it would have cost too much money,” she explained. Instead Ms Webster, who joined the school 25 years ago and has been head for 17 years. came up with the idea of buying a bus and after searching online for “double decker bus” she spotted one for sale on eBay in Banbury, Oxfordshire. The bus cost £7,000, plus another £7,000 to secure the foundations and fixings. The school launched a mini-breakfast club for pupils to come in early, charging £1 per child, and this has already covered the entire cost of the bus. 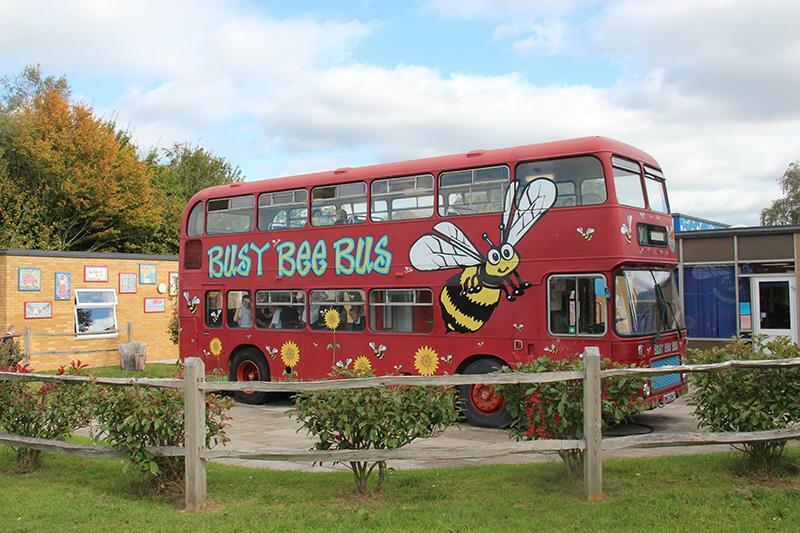 The bright red Busy Bee Bus, which has Aldingbourne’s bumble bee logo on its side and views across the fields, is now an integral part of the school. The lower deck has a big table for group work and the upper deck is kitted out with tables and the bus’s original seats. The floor is covered in a jigsaw puzzle design, complete with motivating quotes like “it is better to be beaten trying than win by lying” and “if you can dream it, you can make it happen”. “The bus has been ‘Aldingbournised’,” said Miss Webster. “We put it on-site during the summer holidays and the children were blown away by it when they saw it. The school was badly in need of a dining space. After free school meals for all infant children were introduced by the coalition government in 2014 West Sussex County Council installed a kitchen at Aldingbourne – but the school lacked a dining hall where children could eat their hot meals. “We are really big on PE here and I wasn’t happy about giving up our school hall,” said Ms Webster. “We do a lot of PE, gymnastics and dance and I didn’t want to lose an hour a day out of the hall. The school community loved the idea and the PTA team immediately started fundraising for the £45,000 cost of the 80-seater diner. A parent who works for event production company GTMS offered to design and build the diner, Rolls-Royce donated £2,000 for the jukebox and Saywell International, a Worthing-based aircraft company, donated more than £7,000 from a Goodwood track day to pay for six 1950s booths. A group of parents called Mick’s March walked round the school field for 10 days, covering 1,000 miles in the process, to raise money for the diner and for the Sussex Snowdrop Trust, a charity that provides nursing care at home for children who are terminally ill.
Now the Busy Bee Diner is complete, Ms Webster and the Aldingbourne team are working on a new project. The school grounds already have a castle, a rock for rock climbing, a ramble route around the perimeter and a tunnelling area made of plastic tubing (the children are equipped with helmets and torches and do problem-solving activities) but the next plan is for a “mile a day” track around the school field. The school has started fundraising and Ms Webster is confident that the track will be ready by the summer term. Each classroom has a jar to collect pennies, which will raise £600, and a host of fetes and events are planned. The idea is that the children will assemble at the track at 8:45am every day and run three times around – a mile in total – before lessons begin. Ironically, Ms Webster did not enjoy school when she was young – but that has made her all the more determined to make sure her pupils do. “One of my big beliefs is in giving children as many opportunities as you can,” she said. “They only get one chance at life and if I can offer them lots of opportunities then hopefully they’ll go out and try them later in life. Only take on one big project a year and ensure it’s something you can actually achieve. “Don’t overload yourself with loads of different projects,” Ms Webster explained.